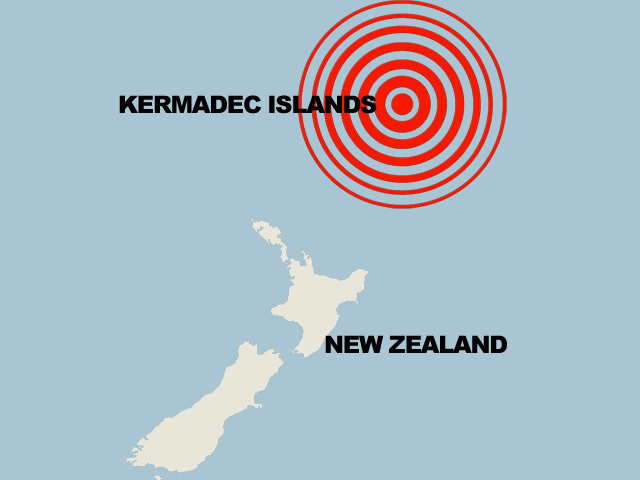 A powerful magnitude-7.8 earthquake rattled New Zealand's remote Kermadec Islands in the Pacific Ocean, the U.S. Geological Survey reported. There were no reports of injuries and experts said it was unlikely any were coming. The volcanic Kermadec Island peaks are a remote outpost that are generally uninhabited aside from a weather station and a hostel for visiting New Zealand scientists. The 7:03 a.m. Thursday (1903 GMT Wednesday) quake was 29.8 miles (48 kilometers) deep, the USGS said. The Pacific Tsunami Warning Center, a U.S. agency initially issued a warning for the Keramecs, Tonga and New Zealand, but the warning was quickly lifted. Geophysicist Vindell Hsu at the Pacific Tsunami Center said that the warning is issued automatically after large earthquakes but that meters show that the wave that was generated was tiny and that it make waves "a few centimeters" higher on the coasts of New Zealand and Tonga. An observer would not notice the difference. The Kermadecs are about 570 miles (920 kilometers) south of Tonga, the nearest major island, and are 736 miles (1185 kilometers) northeast of Auckland, New Zealand.